Recently, I had a discussion with several SolidWorks users about unique ways of exploring and showcasing SolidWorks models, and noticed a common hesitancy when the conversation turned to using animations. To my amazement, this hesitancy came from premonitions that creating an animation is hugely complex or involves a pricey add in. 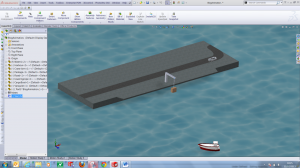 In reality, creating an animation is very easy and the tools to do so are included in every copy of SolidWorks. 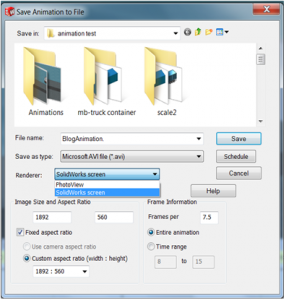 In this blog, we’ll take a look creating an animation. The intention is to have the boat pull into harbour and the package be lowered onto it. We’ll also have a vehicle drive past on the road behind just to make the animation a little more interesting. Bonus points for anyone who can name the car! First step is to prepare the assembly for animation by adding in appropriate mates, the intention here is to limit the axis of freedom in the components we want to animate. 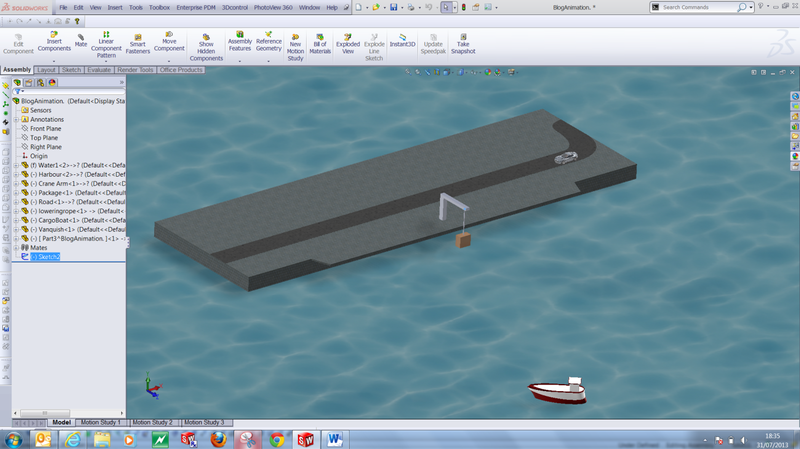 In my assembly this is the boat and the car. As you can see in the images below I’ve mated the boat to a sketch line defining the path I want it to follow. For the car, I’ve mated the tyres to the road to stop it floating away when I try to move it. A top tip here is to ensure the ‘Autokey’ functionality is enabled. 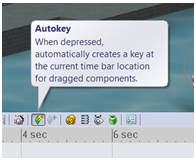 This automatically creates keys in relation to where we have our time bar placed. The purpose of this function will become clearer when I begin to move my components around. I can now start to define the movement of the components in my animation. This is achieved by firstly moving the time bar to the desired position, then simply moving the component in the graphics area. An example of this is shown below, firstly I move my time bar to 13 seconds, then move the boat to where I want it to be at 13 seconds. The same process is then repeated for the car and boat package. A good tip if you have difficulty controlling the movement is to ‘right click’ and select ‘move with triad’ as I do in the images below where I move the car along the road and lower the package onto the boat. Notice I set the package to begin lowering at 13 seconds, this is achieved by simply dragging the start key to the desired time location. The last thing left to do is set up some appropriate orientations for viewing the animation from. This is achieved by positioning the orientation where desired, placing the time bar where you want that specific view to be used, right clicking and selecting ‘place key’. Once you have your view orientations established make use of the ‘recalculate’ button to update your study and preview your animation and that’s it! You’ve created an animation. Use the save button when your happy with the results. When saving you have extensive control over the output with the ability to define file type, aspect ratio, frames rate and so on. Additionally, you have a choice of renderer, with the ability to use either the standard SolidWorks screen or if available, Photoview 360. You can learn more about creating animations in SolidWorks on our website. If you would like to learn more about the design tools in SolidWorks, you can request a free SolidWorks trial on the SolidWorks website. Grant Davidson is an Applications Engineer at TMS CAD Centre, a SolidWorks Value Added Reseller in Scotland. You can read more from Grant on the TMS CAD Centre blog.